Awaiting approval from ANVISA for commercialization in Brazil. 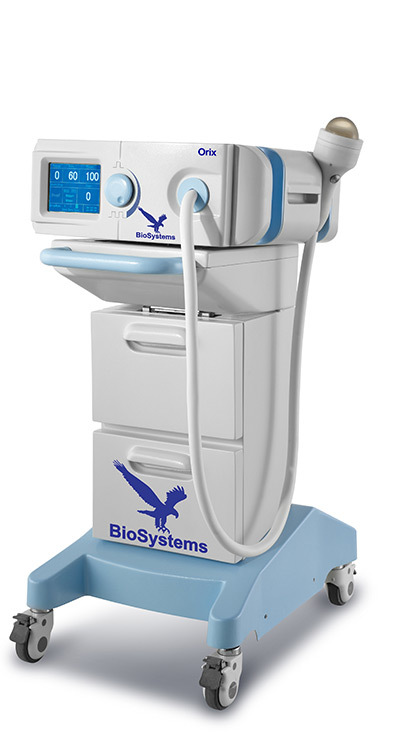 Orix is ​​known as the first portable ESWT from Brazil or perhaps the world. Attributed to the special and compact design it has the possibility of being the first ESWT machine for domestic use. It has definitely set the stage for the application of shockwaves in the world. Lightweight and compact with simplified appearance. Great accessibility and high durability, suitable for all hospitals, private clinics or even for home use. You can adjust all shock wave parameters freely by a button and all parameters will be displayed on the LCD screen. Across the world so far, there has been no report on the adverse effect of shock wave therapy since the introduction of the ESWT 20 years ago. The entire wheel system can be easily moved from one place to another directly or by the trolley connected together.